A rich, delicious addition to many fruit or chocolate pies is sour cream. This page contains sour cream pie recipes. Combine sugar and flour. Add sour cream and cream cheese. Blend well. Put fruit in unbaked pie shell. Pour mixture over fruit. Top with crumbs. Bake at 425 degrees F for 15 minutes. Reduce heat to 350. Bake for 25 more minutes. Delicious! Note: Always have cream cheese and sour cream at room temperature before using! Beat egg yolks, add sugar, sour cream, cloves, and raisins. Cook until thick in double boiler. Pour in pie crust and cool. 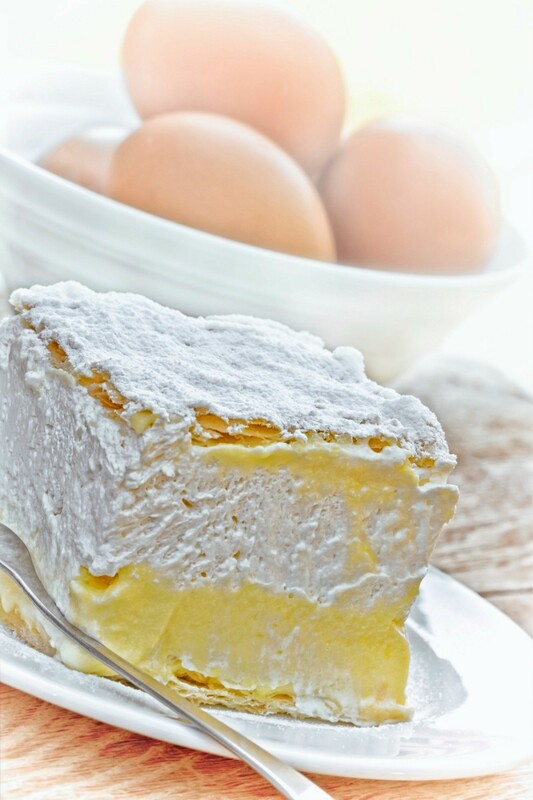 Top with meringue. Mix sugar, cornstarch in 2 qt. saucepan. Gradually add milk, stirring until smooth. Stir in egg yolks, lemon rind and juice until well blended. Add margarine. Cook over medium heat, stirring constantly, until mixture comes to a full boil. Boil 1 minute. Pour into bowl; cover surface of pudding with waxed paper or plastic wrap. Chill. Fold in sour cream. Turn into shell. Chill. Serve with whipped cream or meringue. Combine 3/4 cup sugar, 2 tablespoons flour, and salt; beat in sour cream, beaten egg, and vanilla. Add sliced peaches. Pour mixture into pie shell. Bake at 400 degrees F for 12 minutes. Reduce heat to 350 degrees F, and bake 30 minutes longer. Remove from oven and then increase heat to 400 degrees F. Combine topping ingredients; sprinkle over pie. Bake at 400 degrees F degrees for 10 minutes. Does anyone have a recipe for Bakers Square Sour Cream Raisin Pie? Thank you! ".....the California Raisin Marketing Board in Fresno, CA mailed a four-recipe pie brochure (Classic California Raisin Pie, Dutch Apple California Raisin Pie, The Best-ever California Raisin Sour Cream Pie....."
Even though it's not a Baker's Square recipe, it sounds like it may be even better than Baker's Square's ! Who knows -- the CRMB may have an "in" with Baker's Square. In any case, I'd email them and ask for their recipe, and also ask if they have access to the Baker's Square recipe you are looking for.